Previously on Ripper Street: Someone (or something) is stalking the streets of Whitechapel, biting the hell out of people and killing them. The police thought it was Isaac Bloom, but since it looks like he/it has struck again, Bloom is now an unlikely candidate. 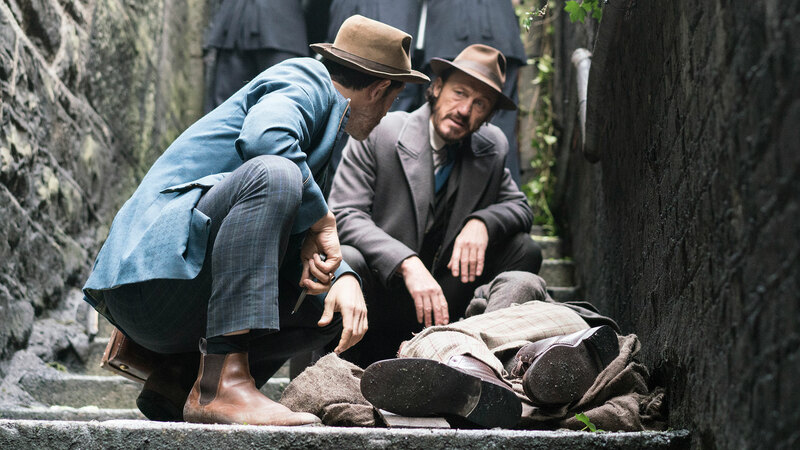 The body of Thomas Gower is found, and Whitechapel is in an uproar. Miss Goren hears about it and arrives at the scene of the crime to very publicly grieve before being taken back to the orphanage for a steadying drink by Reid. There, she tells him the children still see this ‘Golem’ they’d been talking about, and she shows him pictures the kids have drawn of a wolf-like creature. She also reluctantly tells Reid about Castello’s friendship with Matilda, because she’s a bit concerned about the nature of it. Reid detours to Castello’s office to yell at her for ingratiating herself with his daughter in order to get close to him. Castello denies it, though she does kind of apologise for any unwitting advantage she may have taken. While in the office, Reid notes some of her research into the Golem/Bloom case and asks to see it. She refuses to allow it, telling him he’ll have to provide something in return. He heads to Leman Street, where Gower’s autopsy is underway. Since Gower fought back against his attacker, the initial belief is that he died in a drunken brawl, but then Jackson finds a human bite mark on his neck and absolutely everyone pretty much goes, ‘oh, shiiiit.’ Jackson compares the bite mark on Gower to photos of the ones that covered Ratovski’s body and determines they came from the same person, since the teeth marks match. This is not good. Not good at all. Drake tries being in denial for a bit, but then a second body comes in, covered in bite marks, and things start to get crazy. The investigation is now open once again, and everyone keeps telling Drake that this wasn’t his fault and he shouldn’t feel guilty. But he does feel guilty, of course. Doubly so, because not only did his investigation lead to the hanging of an innocent man, it also resulted in the death of Thomas Gower. And he’s got some craziness in his personal life to deal with, too. Apparently, seeing Susan has made Rose go kind of insane. She tells Drake what she saw, and of course he doesn’t believe her because he saw Susan hanged (though, considering the fact that Jackson is clearly some sort of incredible genius, I’m a bit surprised that Drake never once pauses to consider he might have managed to come up with something to enable her to escape). Drake thinks Rose is suffering mightily from sleep deprivation, and maybe she is, because her actions throughout the rest of the episode are definitely not those of a balanced person in the least. First, she tauntingly asks Matilda why she and Reid moved back to Whitechapel, reminding her of all the awful things that happened to her family there. Then, she drags little Connor (who, despite being played by a kid who looks to be about seven, is only about two-and-a-half years old, in the show’s timeline) off to the common gravesite where the hanging victims go, so she can scream at the guard and accuse him of having helped Susan escape because he was in love with her. Yes, she does all of this in front of a toddler who’s already confused and has endured a hell of a lot of upheaval. Mother of the Year. The guard basically says that this just proves all women are crazy and tells her to get lost. Rose apparently spends the day wandering the chilly streets, then arrives at Leman Street in the wake of that second body, so she can freak out some more and scream at Drake in front of all of Whitechapel and talk about how evil Susan was and how, despite that, everyone still seemed to love her. Not sure about that. Also, you were one of those people, Rose, until… yesterday, I guess. Jackson finally manages to put a stop to the madness by coming out, picking up his son, and reminding everyone that there’s an actual child here, caught in the middle of this, and maybe take five seconds to consider that? Then he sends Connor home with Rose despite the fact that she clearly shouldn’t be responsible for anyone else, let alone a very young child right now. But Jackson’s got work to do: Susan wants to rob the customs house tonight! Fun times! But before we get to that, let’s talk about Dove, who always seemed so nice and squeaky clean, I figured he had to turn out to be some sort of baddie. And, oh, look, he is! Maybe. Reid asks Drummond some pointed questions about the Bloom investigation that suggest Dove organised some sort of cover-up and planted the incredibly incriminating evidence. Unbeknownst to Reid, Dove did it to protect Croker’s kind-of son, Nathaniel. Dove even goes to Croker and warns him to keep a leash on Nate, because this can’t keep happening. I’ll say. Reid, meanwhile, takes some pictures of the bite marks on the latest victims and hands them over to Castello. But Reid’s not the only one closing in. When Jackson goes to Croker’s to prepare for that night’s theft, he finds a wolfskin and notes that Nate has the same bite as the Golem. So now he knows who’s doing these terrible things, but like Dove, he can’t bring it to light without also exposing himself. Dilemma! They all go to the customs house and blow the door off the safe. The guards, naturally, are alerted, but Croker makes short work of them, reassuring Susan these lives won’t be on her hands (except, they totally are. Just as much as the train crash victims. She didn’t wield the knife, but it was wielded on her behalf, which makes her just as guilty). They get their loot and all escape into the night.